Congratulations to Eugene C. Miller of Weiner, Spivey & Miller, PLC who has received the prestigious AV® Preeminent™ Rating for 10 Years (2002-2012) from LexisNexis Martindale-Hubbell. 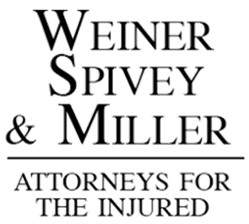 Mr. Miller was given an “AV/5.0” rating from his peers, which means that he was deemed to have very high professional ethics and preeminent legal ability. Only lawyers with the highest ethical standards and professional ability receive a Martindale-Hubbell Peer Review Rating. The AV® Preeminent™ Rating is the highest such peer review rating available to any individual lawyer.